The Earth is undergoing a monumental shift into a higher vibration of consciousness in the Fifth Density. What is that all about? How is it already affecting all our lives, and how can you take an active part in it? A new reality exists, founded on unconditional love, joy and mutual respect for all life. 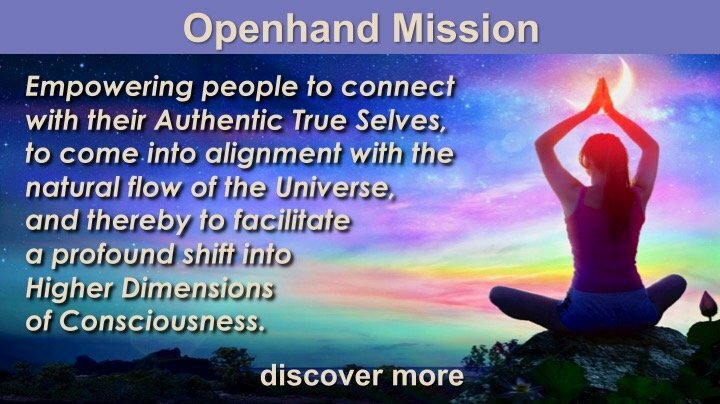 Openhand's 5D Shift Project is an integrated framework of inquiry to support you in your own evolutionary shift. You're on fire!! Excellent video...love love love it!! Congrats. Well done! What a lovely piece of alchemical work guys . The way u have managed to convey the message is utterly priceless & Magical . The music , the camera work ,the landscapes & the editing are absolutely stunning . Much love , I am all in with u all . Open, my eyes immediately alight on your gorgeous, turquoise necklace that draws me in as you speak your truth quietly and clearly. I love that Openhand is a reflection for us to see, feel, and intuit our own truth and honour the sovereignty of our souls. I would be not be part of the Openhand community if it were any other way. How extraordinary it is to attune to the 5D flow of signs, synchronicity, magic, and mystery, continuing again and again to breakthrough the densities that arise to find the path of light beyond that leads me home. How exciting to witness the launch of the 5D project in so many countries around the world including Canada! Yah! Welcome back! I feel a Beatles tune coming on. "Roll up, roll up...step right this way...the magical mystery tour is waiting to take you away...coming to take you away..."
Moving, powerful and inviting video, love it :) have me a few goose bumps!